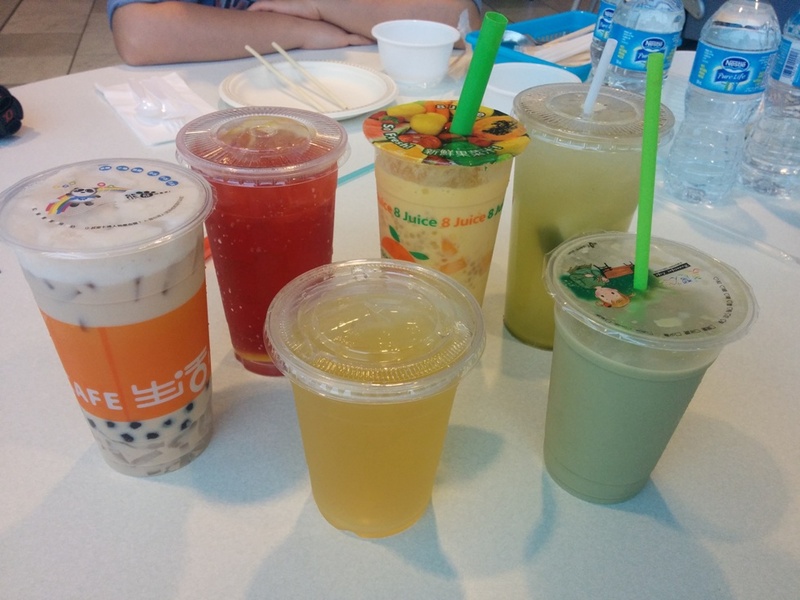 The milk tea with pearls and coconut jelly was pretty standard. The lemon ribena could’ve had a stronger flavour. It just tasted mostly fizzy. 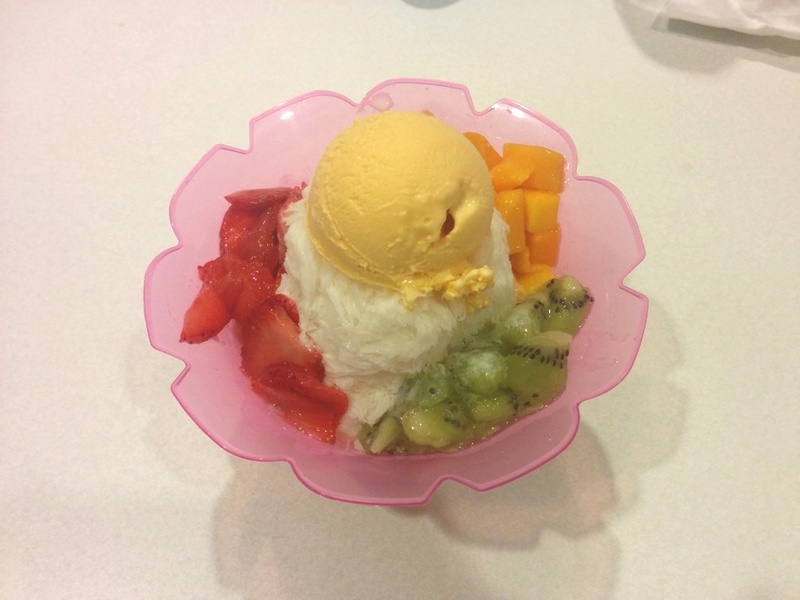 The house special was super thick and full of mango and lots of tapioca and mango bits! It’s a very loaded drink. If you drink the whole thing it could probably be a meal (for me at least). The iced genmaicha tasted just like the cold version of the tea, lots of genmaicha flavour. Wouldn’t be something I usually order. Matcha soy bean was one of my faves since I love matcha. The iced honey matcha tea was like the iced genmaicha, lots of tea flavour but slightly sweeter? Sakura roll (prawn tempura, avocado, chopped scallop). This was from Aji Hana, the only Japanese food stall besides Saboten. 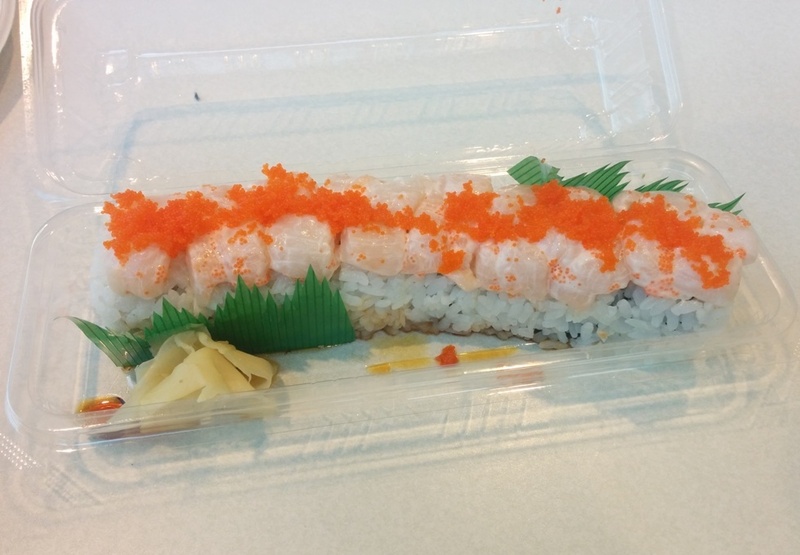 The roll was actually pretty good since I had super low expectations because they’re in the food court. 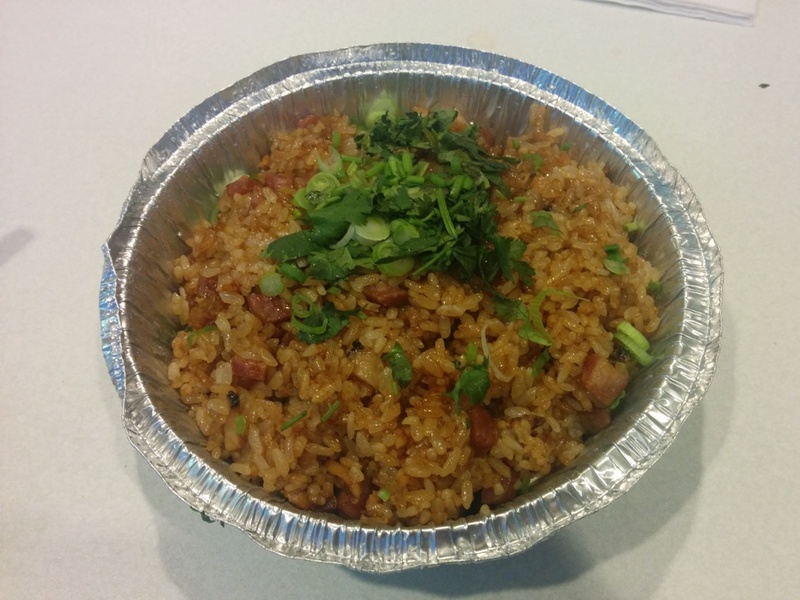 Not too much rice, good amount of chopped scallop. 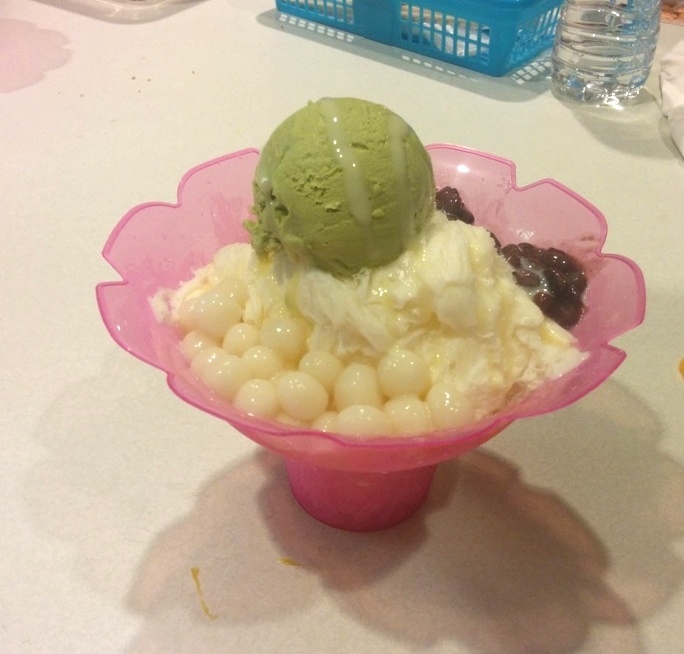 Bubble Waffle from Bubble Waffle Cafe! I believe they also have other flavours like matcha and chocolate. The bubble waffle was okay, I think I’ve had better aka chewier but since they’re the only place that sell bubble waffle here they get tons of business. Also it wasn’t served piping hot when we got it so maybe that could’ve affected my opinion. 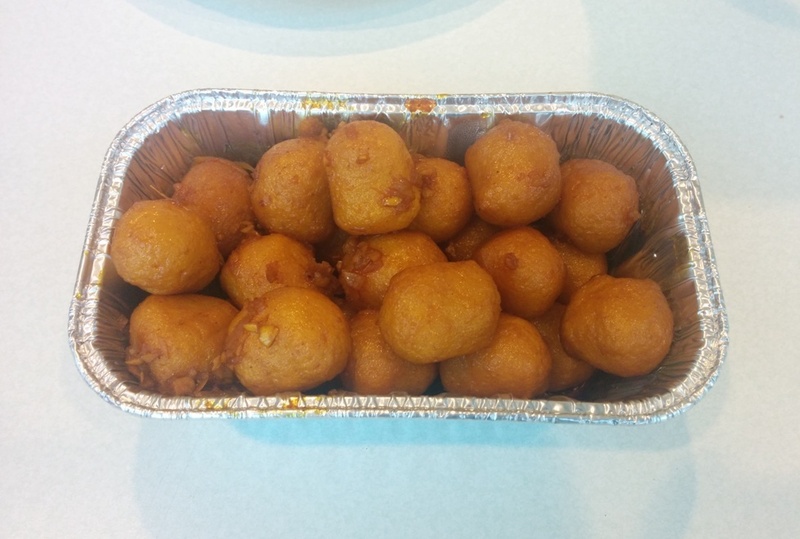 Curry Fish Balls, also from Bubble Waffle Cafe. This had a really good spicy flavour and the fish balls were really bouncy! 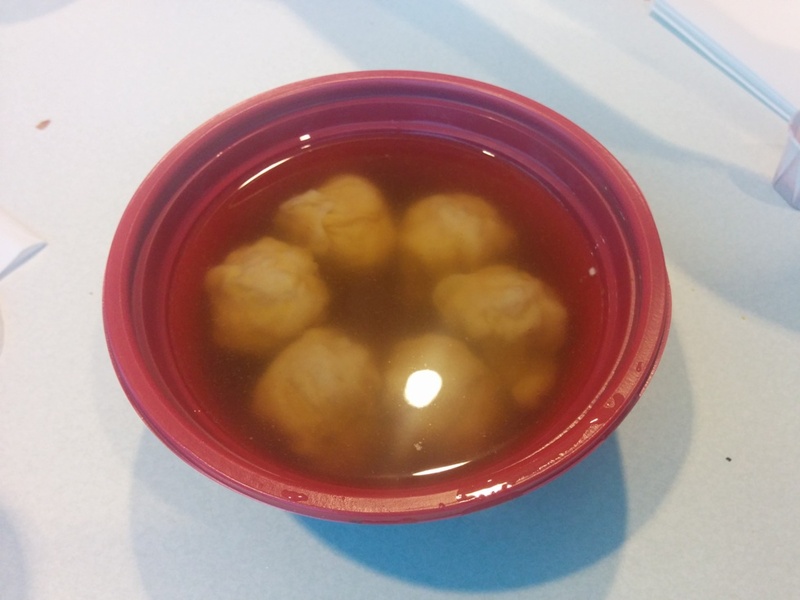 The portion comes with a lot of fish balls so it’s good for sharing. 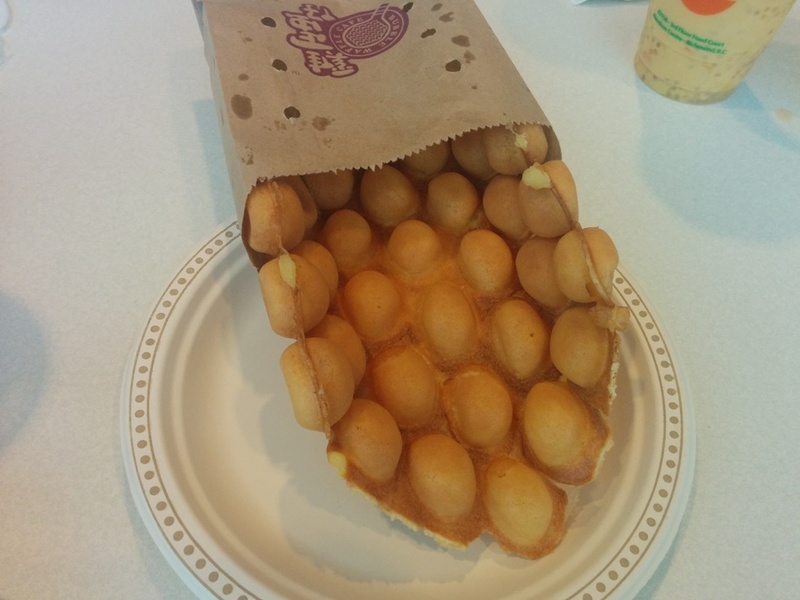 I recently saw that there is a new Bubble Waffle location at the Lansdowne food court too. Pan fried Chinese chives with pork dumplings from Chef of Dumplings. This stall is relatively new so I’ve never tried their food before. 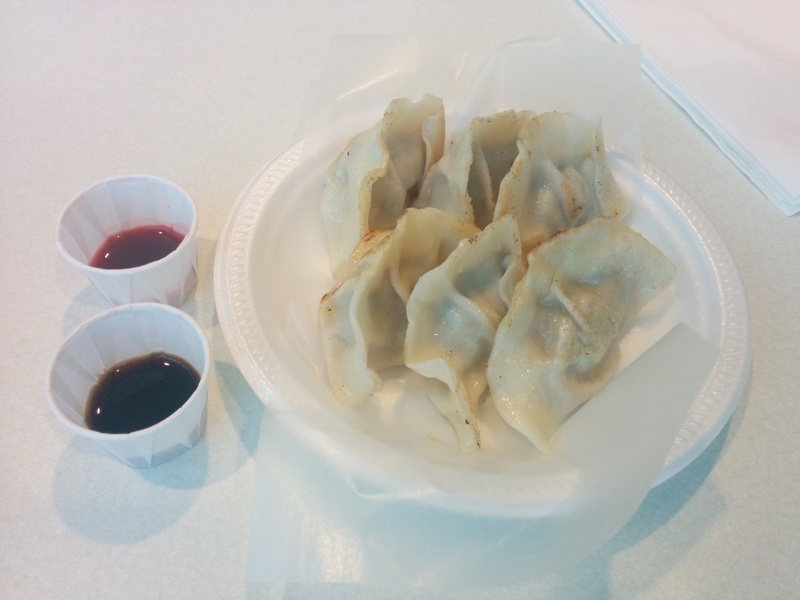 The dumplings were okay. I think I would’ve like them more fried and crispier? These were the Prawn Wontons from Lung Kee. They were so big and full of bouncy shrimp! I realized I don’t have any other adjectives for shrimp besides bouncy. We thought it was on the salty side though. I’m sure most of you have seen these before and can guess which stall they’re from! 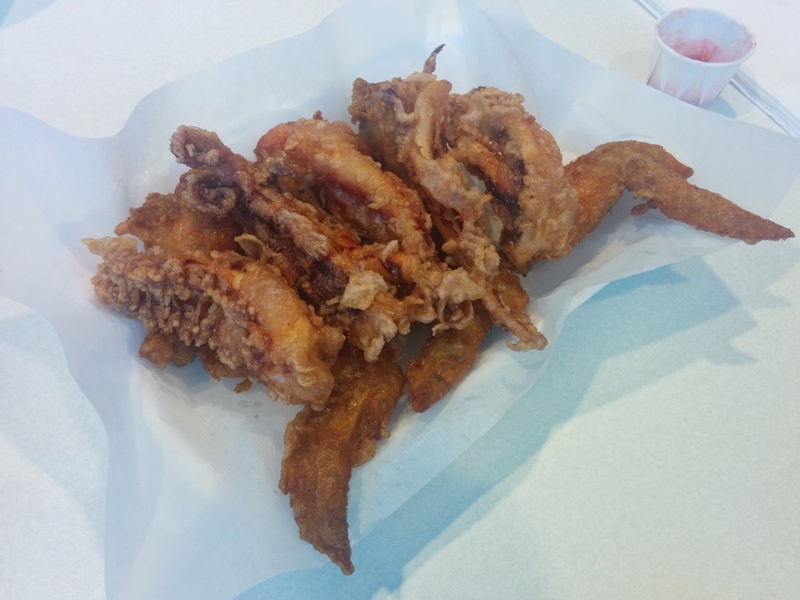 These are the famous deep fried chicken wings from Wo Fung Dessert with some deep fried squid on top! I’ve loved these chicken wings for a long time!!! So well seasoned and crispy and juicy!!! Highly recommend! This was my first time trying their squid which also turned out to be really good and not over cooked or chewy! 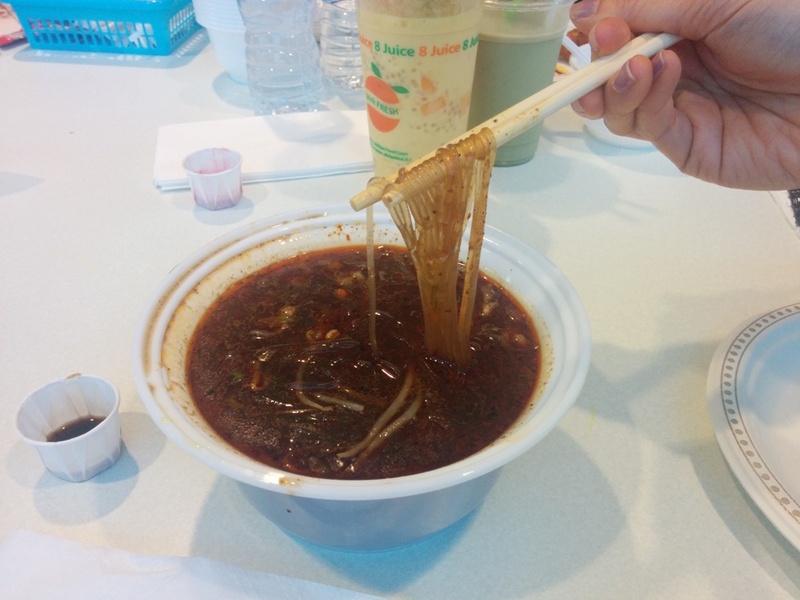 Hot and Sour Noodles from Szechuan House. I didn’t even know there was a Szechuan House stall. These are made with Szechuan peppers so it gives you that tongue numbing spicy taste. I’m not sure how anyone can eat the whole thing! Another favourite of mine! 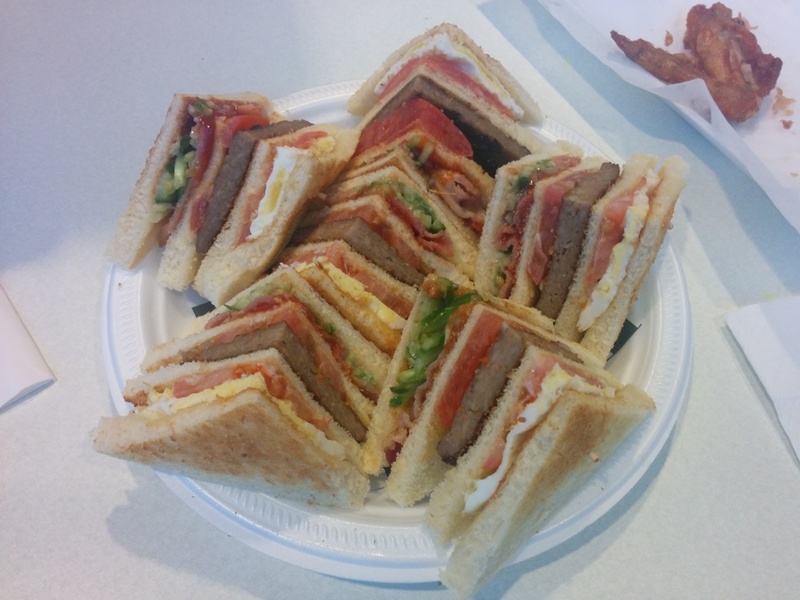 This is the Club Sandwich from Strike. Unfortunately they are not usually presented so nicely like this. It will just look like a regular sandwich cut in half. Besides that, I love how there are many layers and you can taste all the ingredients! My friend CC loves this! Drunken Chicken Hot Pot from Tofu Hotpot. I also did not know this was a stall. 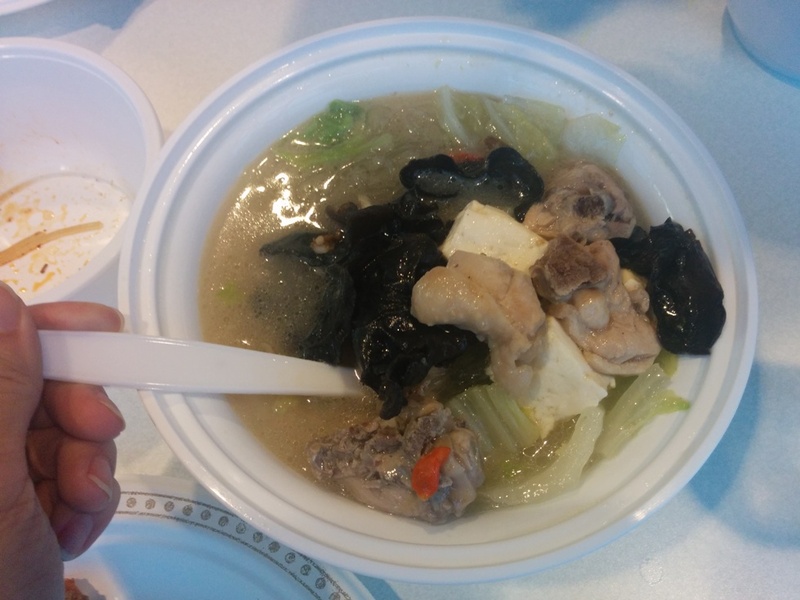 You can taste the wine in the soup and the soup does have a lot of ingredients inside. 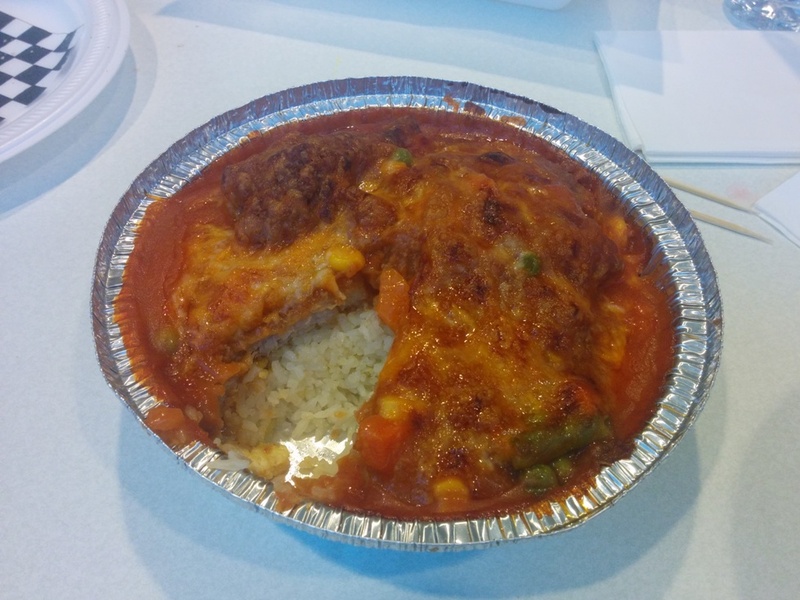 Another HK cafe classic dish: Baked Pork Chop on Rice from Mambo Cafe. The sauce had a strong tomato flavour and the pork chop was super soft. Not bad for the food court. 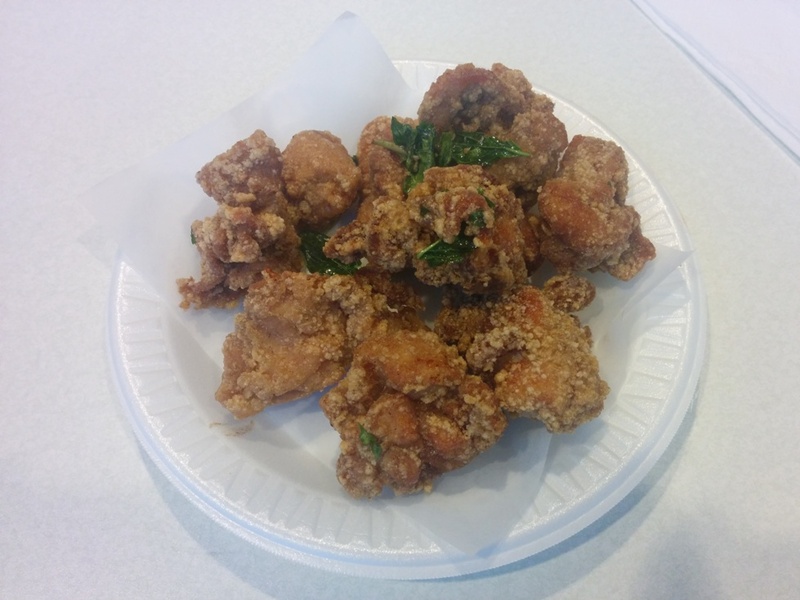 I can eat Taiwanese Chicken Nuggets any day and these ones from Yougo Chicken were as good as any Taiwanese cafe! 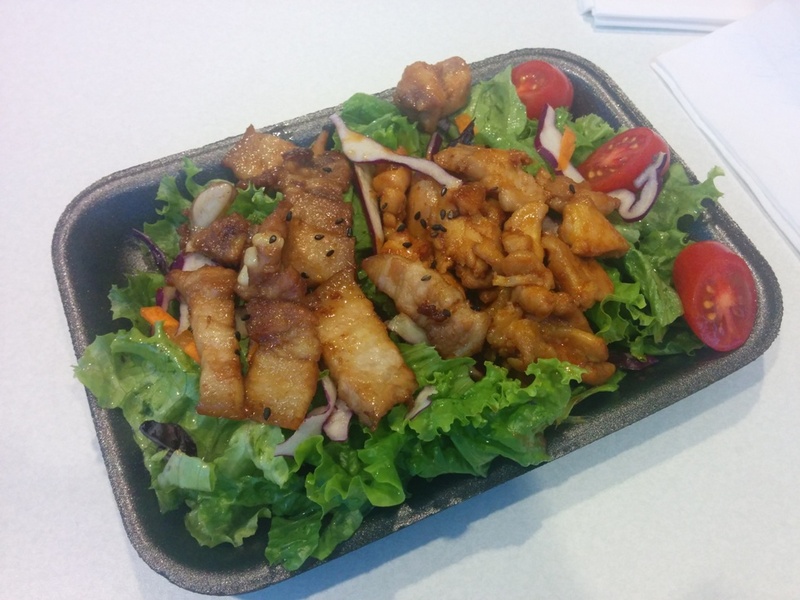 This was the Chicken Bulgogi and Pork Belly from Kitchen Korea. The pork belly and chicken were both very tender and the chicken was spicy too. I love Sticky Rice and I always get it when I’m at dim sum. This version from Leung Kee was really big and sadly I had to make room for the other 20+ dishes I had to eat so I couldn’t have more. I mean it wasn’t amazing or anything but it was sticky rice and it’s always good!!! I’m glad I discovered that they have this here. 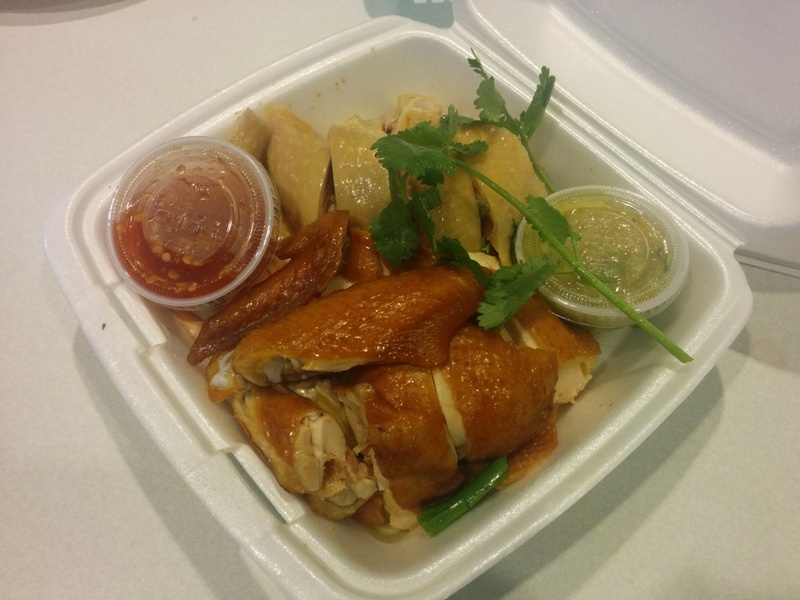 Leung Kee also served up Long Gong Chicken and Soy Sauce Chicken. The meat was tender but otherwise it was standard chicken. Good for the food court though! 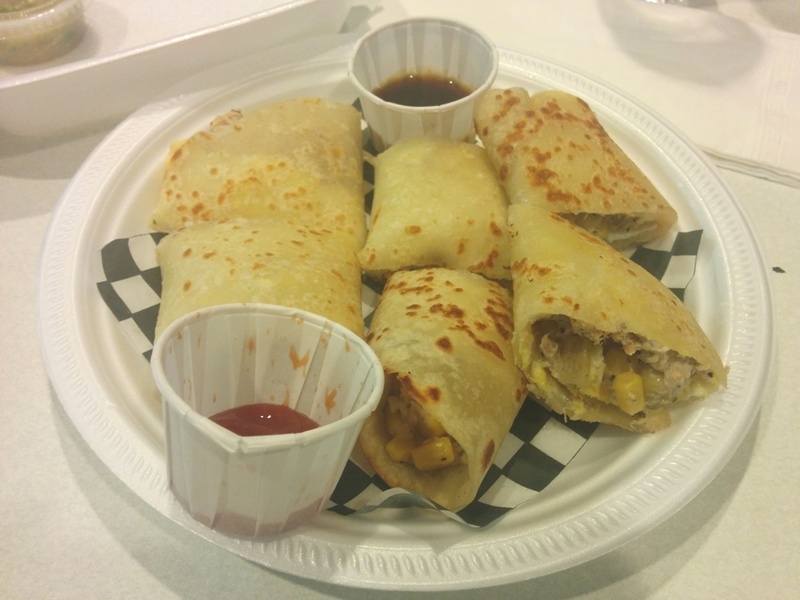 Another dish we tried from Strike was their Egg Rolls. These ones were filled with tuna and corn. It would’ve been okay except that they added way too much pepper and that was all I could taste. I like the soft chewy crepe they used though. I’ve had these before with bacon and that was even better! 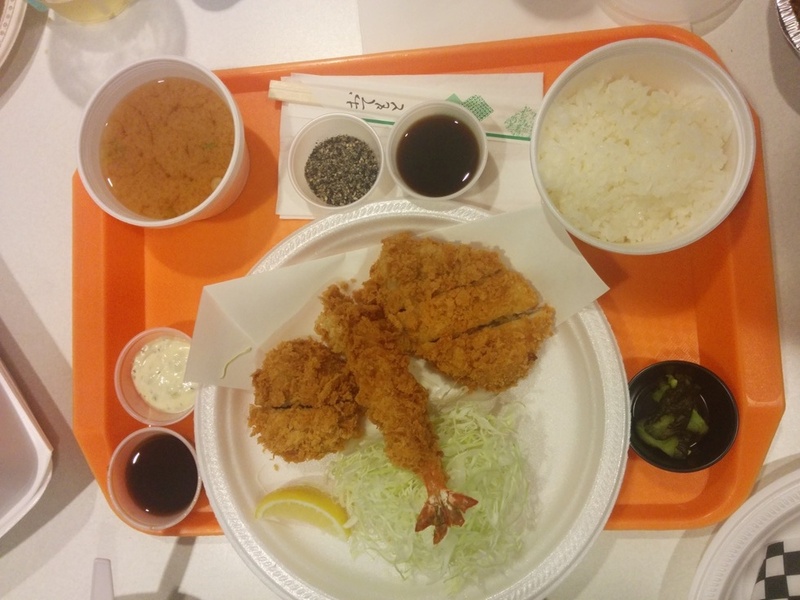 I’ve read a lot about Saboten but I just never ended up trying it since it felt like it was kind of plain? Also the portion didn’t look very big either. The Saboten set had prawn, pork tenderloin, and pork loin. It was also served with a side of miso soup, rice and various dipping sauces as well as some Japanese pickles. I really enjoyed the crispy batter on the meat and it wasn’t dry either. The prawn was also big too. 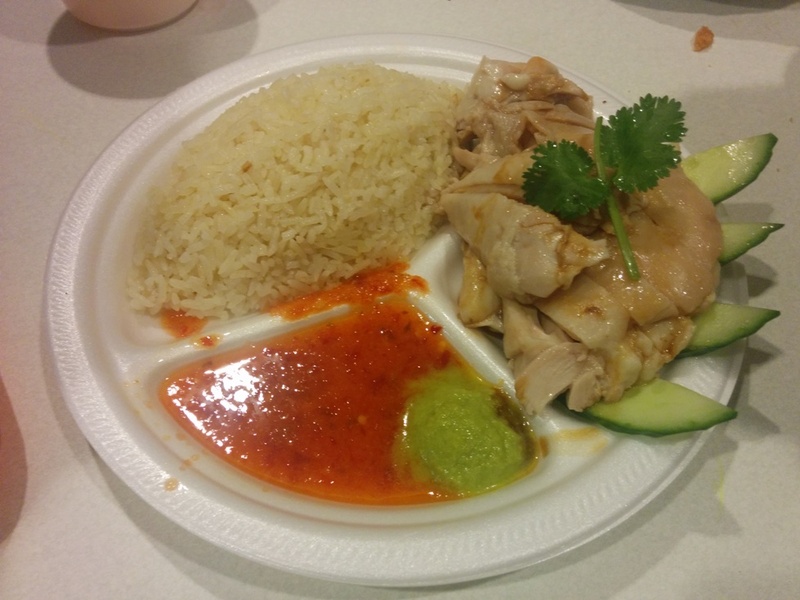 The Haianese Chicken from Cafe D’Lite Express was sooo smooth! I thought the rice was a bit dry from the tiny sample I took. 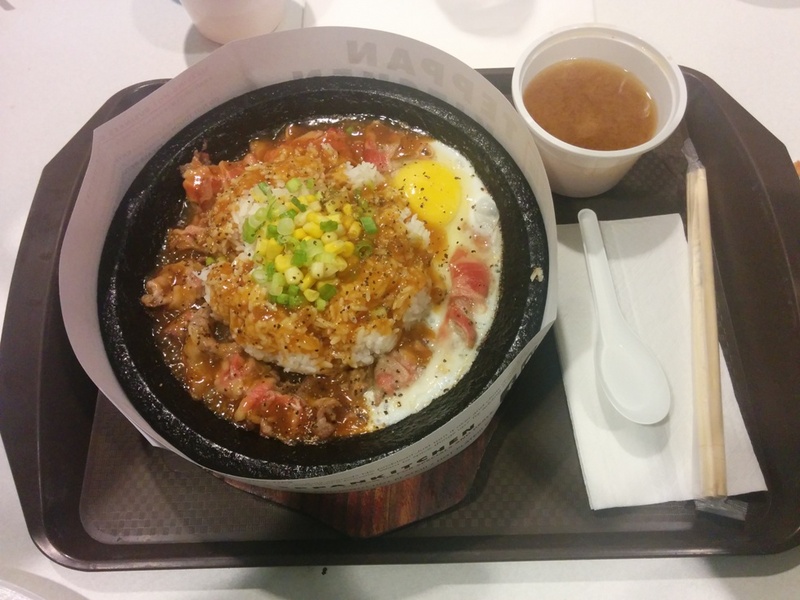 Another hit is the ‘A’ grade ribeye teppan with egg and corn (my boyfriend loooves this and orders it all the time). You mix everything up while it’s still hot and it just tastes really buttery and good with all the sauce!!! I think the egg usually costs $1 more though… not sure about the corn? This came almost last so I was too stuffed to eat much. =( I feel like this is on par with Pepper Lunch so after trying Teppan Kitchen again, I don’t feel like Pepper Lunch is that special. Well okay I knew that before too but it was really hyped up. Not saying it’s bad but Teppan Kitchen is probably the cheaper version and you can always get a table! Finally we are on to the desserts! 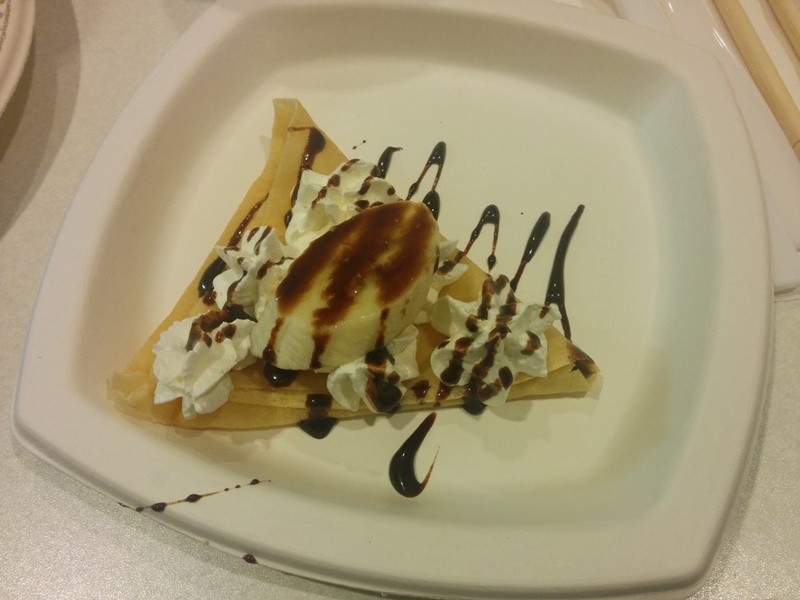 This was the Choco Banana Fresh Cream Mini Crepe from Mazazu Crepe. Okay this was just a plain mini sample of their crepe so not much to comment on and I haven’t had their actual crepes in a long time. The crepe is really chewy though. It also turns out that someone I know is “allergic” to banana. FYI they also have green tea soft serve too! 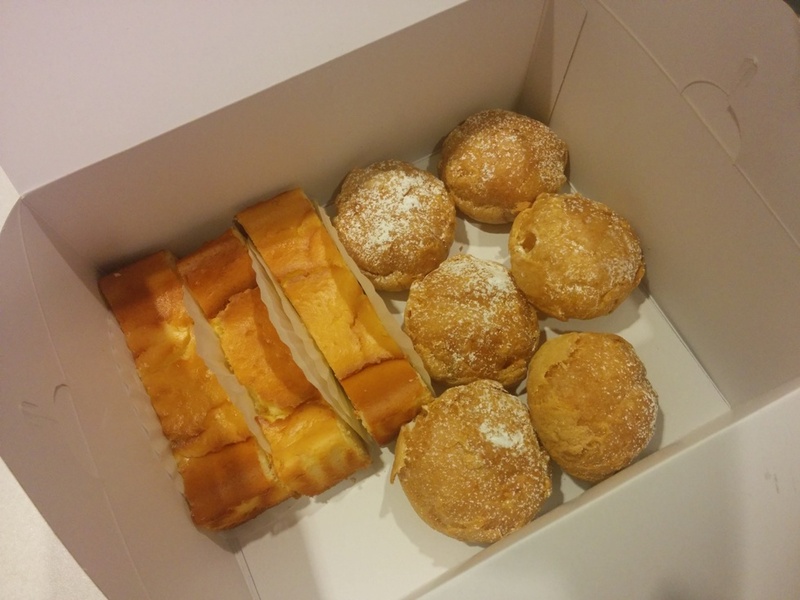 From Beard Papa’s we got their Cheesecake Sticks and Mini Cream Puffs. The cream puffs are filled with fresh cream and the cheesecake sticks are the Japanese kind which are more soft and light. In fact, everything in this box is on the light side for dessert. The first shaved ice we had was A Dream in Eden (strawberries, kiwi, mango, mango ice cream) from Frappe Bliss. I remember the days when they gave you a really big bowl but a less pretty bowl. The shaved ice is light and milky. This is always a good dessert. I used to get their shaved ice a lot but then I got sick of them. They’re still good though. During this event I got to hang out with some other awesome food bloggers (EatMunchLove and Nosh and Nibble) and their +1’s! Good food and good company! We were superbly stuffed and I think I was full for at least 3 days afterwards. However, I have reignited my love for the Aberdeen Food Court and there are some good cheap eats here!